If you follow this blog, which I'm gonna pretend you don't, you'd know that I am a big fan of the old WPIX, Channel 11. I used to eat my lunch and watch the Odd Couple in the afternoon after nursery school. Even though I was never a fan, I loved Phil Rizzuto and those awful early 80's Yankees broadcasts. Who could forget Jack McCarthy's intensive St. Patrick's Day Parade coverage and of course The Magic Garden!!!!!!!!!!!!! 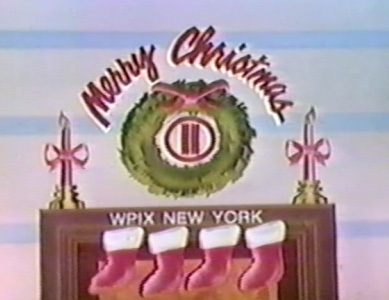 WPIX was always so ghetto and cute; they were the lovable independent underdogs up against NBC and CBS. They made a name for themselves showing lots and lots of old shows and black and white movies that they'd splice up into 5 hour marathons on Saturday afternoons. At Christmas, Channel 11 ran the yule log crackling on an endless loop as Bing Crosby crooned. And of course WPIX was also famous for the many post-news editorials from 1969 to 1995 delivered by the station's vice president of news operation, the venerable Richard N. Hughes. His editorials always ended with the now legendary tagline, "What's your opinion? We'd like to know." Sometimes he would read excerpts from viewers' letters in response to the editorials, invariably closing each excerpt by saying, "And that ends that quote." Hughes' editorials were arguably the best part of the station from those days. From its early years through the 1960's WPIX, like the other two major independents in New York, WOR-TV and WNEW-TV, struggled to acquire other programming. By the early 1970's, WPIX was the clear #2 independent station in the city, behind WNEW-TV. WPIX offered a wide selection of programming including cartoons, rerun sitcoms, dramas, a strong library of movies and Yankees baseball. They called themselves "11 Alive" from 1977 to 1986. But WPIX suffered a drought, ratings-wise, in the late 1980's and early 1990's. During this time, now-Fox-owned WNYW and a resurgent WWOR, relegated WPIX to #6 among New York's VHF stations. It wasn't until they bussed in a new general manager, Michael Eigner from their L.A. sister, that the station engineered a slow turnaround that eventually resulted in WPIX becoming the leading independent station in the New York market. In 1994, they became the exclusive home of the New York City Marathon and in January 1995, WPIX became an affiliate of the new "WB Television Network". And that's when I tuned out. I think WPIX is now known as the "CW Television Network" but I don't really pay attention. I remember there was a story that in the 70's WPIX had been accused of falsifying its news reports such as putting "via satellite" over stock footage, and saying a voice report was live from Prague when it was one of their reporters down the street in a phone booth on Broadway. So anyway WPIX is celebrating 60 years of broadcasting and so they're running a "special marathon of classic programming" on Saturday, June 14 from noon to 9. I can't wait!!!! The 9 hours of vintage programs will include The Little Rascals, Abbott & Costello, The Three Stooges, The Adventures Of Superman, Get Smart, My Favorite Martian, I Dream Of Jeannie, The Odd Couple and The Honeymooners, and so on. The cherry on top will come at 9 pm, when WPIX will air a 60th Anniversary Special hosted by Jim Watkins and Kaity Tong. The hour-long program will take a look back at WPIX from 1948 to 2008. You can check out the official press release & retro- programming schedule here. Who could forget WPIX's venerable announcing staff during the '11 Alive' era: Bill Biery and Ralph Lowenstein, plus occasionally Roy Whitfield alternating with them in anchoring the slides-only sign-off newscasts. As to their futzing of news reportage in the latter part of 1968, which formed the basis for a decade-long license challenge: Such fabrications in coverage, it seemed, were what was spoofed by Chevy Chase in his "Weekend Update" sketches on "Saturday Night Live" in 1975-76 (notably in his "coverage" of the Patty Hearst trial), for those who have the first-season DVD set (and this is WPIX-connected, as Ch. 11 ran hour-long-edit repeats of "SNL" during the early to mid 1980's). Pat Harper left WPIX for WNBC-TV in 1985; she remained with Channel 4 until her retirement in 1991, and then settled in Spain where she passed away from a heart attack in 1994. Other 'PIX alumni who later went to the peacock station included sportscaster Tim Ryan (in the early 1970's) and Jeffrey Lyons (who's still there today). I was wondering whether Richard Hughes was still alive so I did a search and this blog popped up. I loved WPIX growing up, I loved their afternoon programming bloack of Batman, Superman, and the Lone Ranger, I loved 11Alive!, I loved Soupy Sales' return to tv in the late '70s, I loved PIX, etc. The 60th anniversary program was good but it could've been a little better. New interviews with Paula & Carol of The Magic Garden would've been nice. No love for Joya's Fun School?